1. My boyfriend got into a ‘let’s be the sweetest I’ve ever been’-mood. Love that fella! ♥2. My psychology exam went A-okay! Philsophy went ok. Just ok. 3. I finally got myself a safari jacket. A what? you know, one of those jackets as seen #here.4. My new glasses rock! People said I looked smart. Wait… what do they mean by that?5. I watched every romantic comedy they played on TV this week. Love the free evenings after a long day of studying.6. I made banana milkshakes. They’re the best!7. I joined twitter! As of yesterday I am on Twitter. Yes, I know… late comer! BUT, I just never saw the point og having AND Facebook AND Twitter. Yesterday I realised that blogger was the only way I could talk to you guys and let you know how I’m doing, and sometimes I have so much to say without having the need to devote a whole blogpost to it, so I figured why not try Twitter? I can’t believe how confusing Twitter is. I just can’t find my way around there, haha. It’s kinda like beeing on facebook for the first time. It’ll just take some pratice and getting used to I guess. Too bad Twitter doesn’t support Belgian networks, So I can’t use my cellphone to tweet. What made your week beautiful? Yay- congratulations on finishing your exam! You deserve some relaxing time now! what a lovely photo of the basilica! I'm glad you survived all your exams, and I'm sure you did wonderfully. glad to hear you did well on your exam! and isn't twitter fun? welcome to twitter!! rome, daar zou ik ook wel willen. i read through all of that, and sounds kinda similar to my week aha! Although….i dont have a boyfreind! haa! No way did you take that! WOwzers! And I heart smart glasses. And safari jackets! wow that photo is breathtaking! you happen to go to all the places I've always wanted to go 🙂 congrats on your exams! ps.. I love your last outfit! the photos are so lovely! Love the exam count down a the top of your blog. Mine are finally over, so I know how you feel. I'm thinking of joining Twitter myself. cheers to you and your boyfriend for being the sweetest ever! 🙂 have another great week ahead! Great photo, awesome list. Sounds like you had an incredible week even if there were some strange compliments mixed in, haha. Wow, this picture is gorgeous! 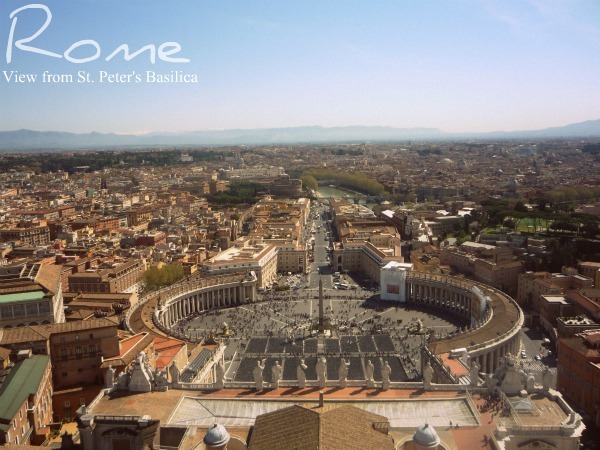 I've never been to Rome, so yeah… I'm pretty jealous right now. Dayummm TWELVE colors of the same cardigan? Haha, you win! I have 5 colors of the same sweater and I thought THAT was extreme! Oh well! yes, twitter is pretty confusing once you first start! i love your picture! it makes me want to travel even more!! hey pretty! Lovely blog! thanks for your sweet comment on mine 🙂 Belgian huh?! cant.even.imagine. now i must go there..because i like to stalk bloggers all over the globe. creeper. Twitter is SUCH a pain to get used to, but once you do it's really fun!! I had to join + quit three or so times before I finally able to see why everyone likes it. LOL! It's all about talking to friends + connecting with fans. I love it now! It's too bad you can't use your phone to tweet, though. That stinks.